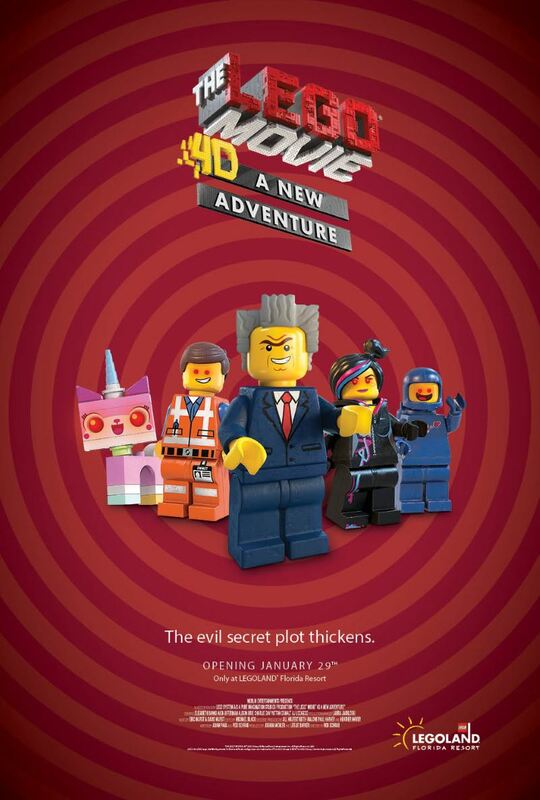 The LEGO Movie 4D A New Adventure opens Jan. 29 at LEGOLAND Florida Resort in the Wells Fargo Fun Town Theater. The little, yet equally handsome and equally evil brother of President Business has one mission: to unleash an Evil Secret Plot involving the heroes from “The LEGO Movie.” And to become the most famous evil villain and movie star in the whole world. Okay, maybe he has two missions. The brand-new attraction introduces Risky, a bold visionary who crosses paths with Emmet, Wyldstyle, Unikitty, Benny and MetalBeard in an entirely new story set after the events of the blockbuster movie. In “The LEGO Movie 4D A New Adventure,” Risky Business unveils an ambitious project inspired by the movie heroes’ original adventures, where all is not as it seems. Featuring the same sharp wit and LEGO scenery that made the “The LEGO Movie” a worldwide smash it, the attraction combines 3D film with “4D” atmospheric effects like water, wind and fog to create an experience that will tickle the senses of every guest. Bringing Risky Business to life is actor, writer, comedian and film fan Patton Oswalt, who joins actors Elizabeth Banks (Wyldstyle), Alison Brie (Unikitty), Charlie Day (Benny) and Nick Offerman (MetalBeard) from the blockbuster movie. The 12 1/2-minute film will appear exclusively at LEGOLAND Parks and LEGOLAND Discovery Centers, and will screen several times a day in the Wells Fargo Fun Town Theater at LEGOLAND Florida Resort.